Have you considered joining the Osage City Chamber of Commerce? Did you know that you don’t have to own a business to be a member of the Osage City Chamber of Commerce? Are there different types of memberships? What are the benefits of belonging to the Osage City Chamber of Commerce? Any person, firm, association, corporation, partnership, non-profit organization or estate having an interest in the objectives of the organization shall be eligible for membership. Regular Memberships – Any person, firm, association, corporation, partnership or estate having an interest in the objectives of the organization shall be eligible for membership. Any regular member shall have the discretion to designate their voting member. Non-Profit Memberships – non-profit organization being a regular member with a member designated for voting purposes. Associate Memberships – Any person having an interest in the objectives of the organization. Associate Members have no voting rights, nor may they serve as an officer or director, unless otherwise approved by the Board, but they will have all other membership privileges and responsibilities. Any applicant shall become a member upon payment of the regularly scheduled dues. As a member of the Osage City Chamber of Commerce you are more informed, better educated, and directly connected to your peers. Whether you are an individual, firm, association, corporation, partnership, non-profit organization, estate, starting a new business, or you are an established business owner, membership with the Osage City Chamber of Commerce provides a multitude of opportunities to grow and connect to the community. For more information about becoming a member, email: osagecitychamber@gmail.com; visit our website www.osagecitychamber.com, or call 785-219-2510. Membership drive for 2019 will begin at the end of October. If you would like to be a member of an organization that strives to continue to improve the community, please consider joining the Osage City Chamber of Commerce. Planning has begun for the annual Christmas on Market celebration Nov. 24. We encourage you to mark the date on your calendar and plan to shop local that weekend as many of our hometown businesses will be offering great opportunities for holiday gifts. The theme this year is: Christmas on Market 2018: “Country Christmas”. In addition to shopping, activities will be held throughout the day including breakfast, lunch, visits with Santa, jingle bell run 5K, in store activities, chili cook-off, chili feed, gingerbread house building, craft show, raffle drawing, Kansas City Chief’s Wolf mascot, Topeka Pilots ice hockey mascot, Topeka Drum Corp, free photo booth, free poker run, bake sale, emergency services showcase, fire truck rides, ping pong throw, story time, bingo and the traditional lighted Christmas parade. Event details will be announced as they are confirmed in the coming weeks. If you are interested in helping with the planning of this annual Chamber event, contact Jeanette Swarts at 785/249-5451. The next planning meeting will be October 3, 5:30 p.m. at Harmon Dental office. For the second consecutive year, Osage City has been asked to welcome the bicycle riders and relay runners as they travel through Osage City on the Dirty Kanza Promotions “Rush the Rails” event on Saturday, October 6th. There are three locations that will designate the length of the trail chosen by the participants. The route starts in Osawatomie, full distance (96 miles); Vassar/Pomona State Park, half distance (54 miles); Admire, short distance (25 miles); finish line at Council Grove. Participants may choose which course length they want to participate in. The relay runners will be either a four person team or eight person team. This is not a timed event. The Chamber of Commerce will host the event at the Depot as the Santa Fe Park area has been designated as one of the stopping points for the participants. The Chamber of Commerce would like to take this opportunity to show off our community and express our generous hospitality. Participants will be welcomed to take a break and relax on the shaded lawn of the Santa Fe Park, enjoy snacks provided by the Osage City Kiwanis Club and the Osage City Lions Club, sandwiches, water refills, which will be provided at the Depot. The Depot Museum and model train areas will be opened for the visitors to enjoy and learn a little about the history of Osage City. Osage City and surrounding communities are welcome and encouraged to come and visit with the participants that will be passing through our community throughout the day from approximately 10:00 am to 3:30 pm. Contact Jeanette Swarts at 785-249-5451 if you have any questions. Come sample dozens of craft and import beers featuring several brewed right here in Kansas. Enjoy the music of The Bryton Stoll Band while satisfying your hunger from the Saucy Lady BBQ food truck. There will be a raffle table with drawings for some awesome craft beer related items. Every taster will get a sample glass to take home. Event will be from 4:00-7:00 p.m. Sept. 29th at the Pavillion, Osage City Fairgrounds. Ticket sales benefit the Osage City Chamber of Commerce, which in turn benefits The Warmth Fund, E.C.A.T., college scholarships for high school seniors and the July 4 fireworks, among others. Advance tickets are just $25 with tickets at the gate $30 with DD’s. Tickets are available at Jerrys Thriftway, Stark Car Wash, Bank of Osage City, Mulready’s Pub in Emporia and online at brownpaperticket.com All attendees must be at least 21 years of age. COF is celebrating their 50th year & they would like to invite the community to attend an open house Wednesday, September 26 from 11:00-1:00 at their facility located at 532 Holliday (old Dollar General Store). The Chamber of Commerce will be having a ribbon cutting ceremony & the COF will be serving a light lunch with an opportunity to meet the staff & tour the facility. September marks the fourth & final month of recognizing a “Yard of the Month” for 2018, sponsored by the Osage City Chamber of Commerce. Recognition was during the period of June through September. The selection of the yard took place during the first few days of each month. In appreciation of the beauty and hard work for the selected yards, the home owners will receive a $25 Osage City Chamber Buck Certificate to be used at any Osage City business. 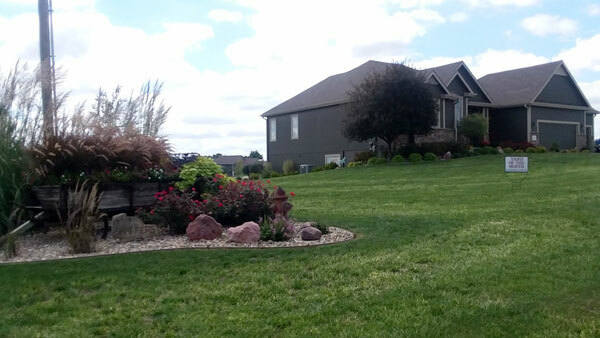 With the assistance of Mother Nature providing the area some much needed rain, Robert & Cheryl Shaffer’s yard became green again along with their beautiful & intriguing landscape areas. We are pleased to announce that Robert & Cheryl Shaffer’s yard has been selected for the month of September. Their home is located at 849 Romine Ridge. It is that time of the year again for the Fall Osage City Citywide Garage Sale. This is a great opportunity to roam around Osage City looking for the best bargains or to get rid of some of that “stuff” you never use and free up some space. The Citywide Garage Sale is set for Sept. 14 and 15. For a map of the sales, stop by Peterson’s Assisted Living (Tricia Gundy), the Bank of Osage City (Kaitlin Swindale) or the First National Bank (Kathy Ayers), or other area businesses. Osage City Chamber of Commerce members for 2018 include the following. Whenever you need services or products in the Osage City area, remember to check with your fellow chamber members first. 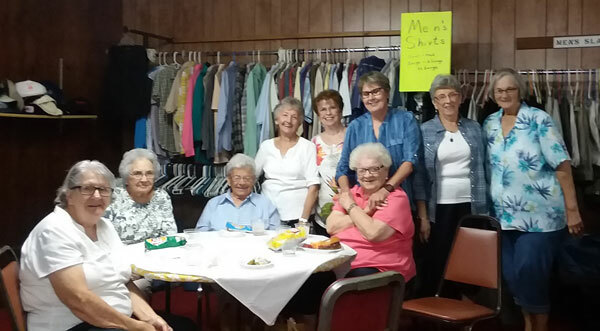 Relaxing “after hours”, from left, Donna Anderson, Dee Croucher, Pat Gundy, Shary Hallgren, Mary Tomlinson, Dorothy Meyer, Kathy Lincoln, Janet Steinle, Nadine Tindell. On July 25, 2018, ECAT sponsored the Osage City Chamber of Commerce “After Hours Mixer”. A light dinner of grilled hamburgers with all the fixings was served. President Kathy Lincoln thanked everyone for their generous donations throughout the year. Kathy also explained how ECAT is the only non for profit organization in Osage City serving up to 400 people a month. ECAT’s mission is to reach as many people in unfortunate circumstances as possible. They not only help with food and clothing but also with rental assistance, prescriptions and gas cards. ECAT also has several other projects throughout the year. None of which would be possible without the support of our generous and caring people of Osage City. A big thank you to everyone who has helped us in anyway. 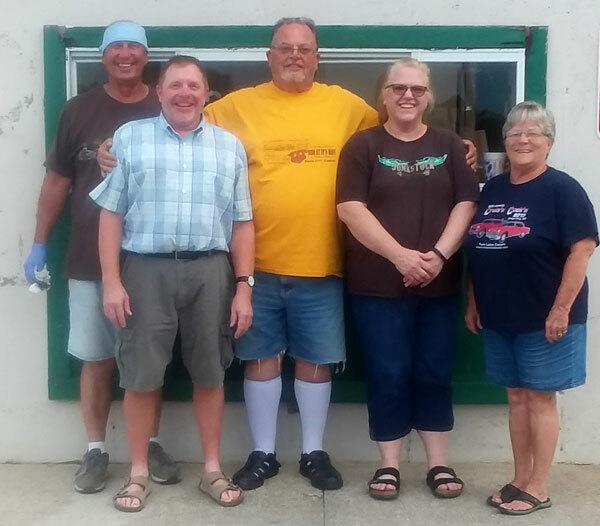 Concessions volunteers, from left, Richard Swarts, Jeff Pearson, Dave Azwell, Vida Lewis, andJeanette Swarts. The Osage City Chamber of Commerce served concessions at the baseball concession stand July 9-13, 2018. A variety of food items other than the furnished items by the Recreation Commission were served. Food items that Chamber members donated were frozen grapes, baby carrots with ranch dressing, sloppy joes, walking tacos, chili, cookies, brownies, root beer floats, ice tea and ice. Grilled hamburgers and hot dogs were a continued item from last year as they were a big hit with the players & fans. The aroma of the hamburgers grilling got the attention of the hungry parents and ball players, thus kept the grill going most of the evenings!! Would like to thank the members, Jan Ogleby, Jeanette Swarts, Julie Carlson, Vida Lewis, Casey Mussatto, Dave & Tara Azwell, Nancy Washburn, Jeanette Stromgren, Vintage Park, Ann Lusk, COF, Thelma & Joe Humerickhouse, Adam & Beth Burnett, Tricia Gundy, Debbie Rinzler, Ronda Harmon and Robyn Williams for their contribution of either food items or working at the concession stand. Would also like to thank Richard Swarts for keeping the grill going. The success from the events are measured by the support and enthusiasm from everyone & we did have a successful week and the proceeds go back to the Chamber. Michael Smith & Danny Lindahl, Emporia, inaugural disc golf tournament champs. 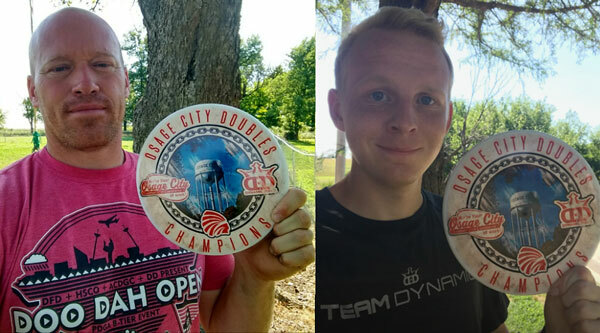 July 1st, 2018 the Osage City Disc Golf Course hosted their inaugural Osage City Disc Golf Doubles Tournament to help raise funds for the annual fireworks show. The tournament had participants from Abilene, Salina, Emporia, Lawrence, Topeka & local Osage City. Skill levels ranged all the way from beginner to the current PDGA Junior World Champion Isaiah Esquivel out of Emporia. Teams played two rounds of 18 holes with the winner having the best 18 hole average after the two rounds. The winning team received 20% of the tournament proceeds, along with two custom made putters created by Dynamic Discs out of Emporia. At the end of the two rounds a team from Emporia, Michael Smith & Danny Lindahl came out as the Inaugural Champs! Everyone that was involved with the tournament would like to thank those that played an integral part in making everything come together. First off, the tournament would not have happened with the initial idea from the Chamber of Commerce and their support for wanting to bring attention to the new course in town. Also, a big thanks for supplying water to all the participants of the event. Next, a big thanks to the City Staff as they did a lot of prep work for the tournament and their work did not go unnoticed as teams constantly mentioned how nice the course looked which is a testament to the hard work and attention to detail that every city employee put into the tournament. Thanks to Dynamic Discs for creating the prized putters that were custom made to be a resemblance of Osage City which did not disappoint. Lastly, participants Michael Smith and Lupe Esquivel were vital resources when putting this tournament together, and with their guidance and expertise helped the tournament become a success and will lead to future tournaments being hosted there in the years to come! As a part of the July 1, 2018, Chamber of Commerce Fireworks Celebration, ORBIS Corporation held its first annual fishing tournament in remembrance of Ruben Chavira, an avid fisherman and an employee at ORBIS who died May 31, 2017, from a fatal accident at the plant. The official count that participated in the tournament was 22 participants with trophies awarded for most, biggest and smallest fish and small gifts for all attendees. The community building was filled with fun games as part of the fireworks celebration. The Osage County Fair Association asked the Osage City Chamber of Commerce to take over hosting the annual “Fireworks Celebration”. Committee members, Thelma Humerickhouse, Jeff Pearson and Jeanette Swarts decided to organize the celebration into a family oriented event which included activities for everyone. 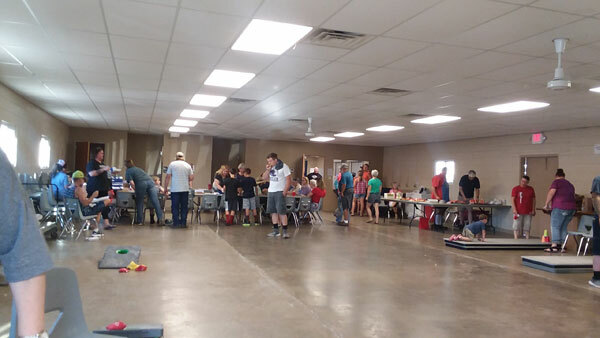 Starting in the morning, the day of events included a Youth Fishing Tournament, sponsored by ORBIS Corporation, Community Worship Service, sponsored by the United Methodist Church of Osage City and Disc Golf Tournament, organized by Erick Punches and sponsored by the Chamber of Commerce. Mid-afternoon, the Osage County Community Patriots’ Choir presented a very entertaining patriotic concert for the public. Activities started in early evening with bounce play sets, sponsored by the Conrad Carlson Foundation, a mini car show featuring the Twin Lakes Cruisers along with other area car buffs, a variety of free games including plinko, ring around juice bottles, knock down the cups, duck pond, fireworks walk (a.k.a cake walk) and bingo. The games were sponsored by the Chamber of Commerce and Garrett’s Fireworks donated the fireworks for the fireworks walk. Would like to thank the Chamber member volunteers that assisted with the event were Joe & Thelma Humerickhouse, Jeff Pearson, Jeanette Swarts, Jodi Lohmeyer-Stark, Jeanette & Sydney Stromgren, Angie Theel, Shanda Koett, Ronda Harmon, Rick & Zina Bryan, Susan Buenger, Debbie Rinzler, Barb Pope. Would like to thank them for their time and assistance. Delicious food and snacks were provided by Mama Rita’s Mexican, Wiley Weenie Wagon, Thrill’s Kettle Corn and Pomona Masonic Lodge #41. The Osage City Kiwanis Club provided watermelon slices, Lions Club sold pie & the 4H sold homemade ice cream. Local music group, “The Tweed Tones” provided a variety of live music throughout the evening leading up to the fireworks show. Prior to the fireworks show, recognition was given to each branch of the armed services with its own service song being played, recognizing those that have or are serving in the armed forces & to honor those that have given their ultimate sacrifice for our country. To lead off the fireworks show, Holly McConnell so eloquently sang the National Anthem. Scott Farmer & his staff created a very entertaining and powerful fireworks display which was enjoyed by everyone. Thank you to all donors to the Fireworks Celebration! The Osage City Chamber of Commerce would like to thank the following contributors for their generous donation and support for the Fireworks Celebration. AG Choice, Auburn Pharmacy, Bank of Burlingame, Bank of Osage City, The Body Shop/Buenger Automotive, Branine Chevrolet-Buick, Burns, Burns, Walsh & Walsh, Citizens Insurance Services, City of Osage City, David Jacoby-OD, Edward Jones Investments, Kirk Bath Farm Bureau Financial, First National Bank, H & H Appraisal, Harmon Dental, Jerry’s Thriftway, Jodi Lohmeyer-Stark Agency, John’s Barber Shop, Landmark National Bank, Marilynn’s Restaurant, McCoy’s Electronics, Miller Elevator, ORBIS, Osage Building Materials, Osage City Chamber of Commerce, Osage City Municipal Golf Course, Osage City Kiwanis Club, Osage City Lions Club, Osage County Community Foundation, Osage County Farm Bureau, Porter Cattle Co, Quality Built Construction, Casey & Cheryl Mussatto, Rod & Kim Bergquist, Cathryn Houghton, Dan & Linda Mollnow, Brian & Jeanette Stromgren, Richard & Jeanette Swarts. August marks the third month of recognizing a “Yard of the Month”, sponsored by the Osage City Chamber of Commerce. Recognition will be during the months of June through September. The selection of the yard takes place during the first few days of each month. In appreciation of the beauty and hard work for the selected yard, the home owners will receive a $25 Osage City Chamber Buck Certificate to be used at any Osage City business. Even through the lack of rain & hot weather the past month, Dee Cason has managed to keep her knock out rose bushes & flower beds surrounding her home looking beautiful. 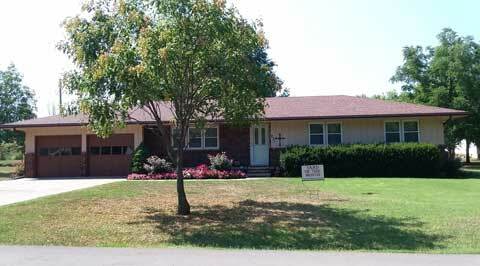 We are pleased to announce that Dee Cason’s yard has been selected for the month of August. Her home is located at 231 Safford. The Osage County Fair Board worked hard this year to have this be one of the best fairs so far. Activities this year from Wednesday, June 27 through Saturday, June 30, included exhibits, 4-H activities and competition, Chamber of Commerce Parade, live band, family fun night, pie contest, carnival, cooking demonstration, Shootin’ Hoops 3 on 3 Basketball Tournament, Football 7 on 7 Tournament, pet shows, antique tractor show and pull, kids pedal tractor pull, Barnyard Olympics, 5K “Glow Run Run”, dance party. Looking forward to another great fair week in 2019. 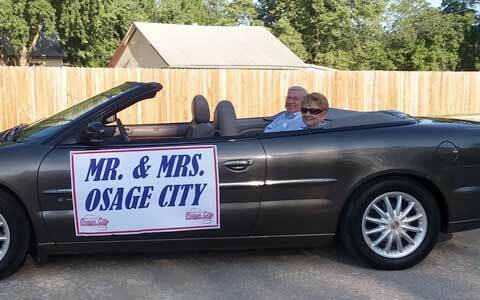 The annual fair parade, sponsored by the Osage City Chamber of Commerce was Thursday, June 28 at 6:30 p.m. The theme for the parade this year was “Hats Off to Red, White and Blue”. Jeanette Swarts commented that Diane Michael, parade chairman did a fantastic job coordinating a variety of entries including the Boy Scouts of Osage City starting the parade as flag bearers, emergency vehicles, including the City and County law enforcement, ambulance and fire department, Parade Marshal, Mary Lou Estes and Mr. and Mrs. Osage City, Jerry and Marilyn Giesy, floats, golf carts/ATV’s, band, politicians, antique tractors, horses, etc. Even though the heat index was very extreme at parade time, the participants were eager to have a great time & the spectators seemed to enjoy the entries. This year, the Chamber had a coloring contest for grades 1st through 6th. The entries submitted were well done and the selection was difficult. Eight winners were selected to ride on one of the fire trucks in the parade. The winners were 1st Grade-Devin Theel and Ashlyn Nihiser, 2nd Grade-Kaylee Theel and Jordyn Lickteig, 3rd Grade-Sophia Brabb, 4th Grade-Justin McKnight, 5th Grade-Kasen Parsons, 6th Grade-Maddie Renfro. All of the submitted entries are in the downtown old Duckwall store windows (6th and Market). Please take a moment to take a look at some of the young artists in the community. The float entry awards went to First Place, $125 – Conklin Plumbing; Second Place, $100 – Friends of Pomona; Third Place, $75 – Republican Women; Fourth Place, $50 – Lyndon Leaders. The Golf Cart/ATV entry awards went to First Place, $30 – Boyd Woodyard; Second Place, $20 – First National Bank of Kansas; Third Place $10 – April Pete. As Diane Michael stated, we are hoping that next year there will be more involvement of floats, school bands, etc., thus there will be have a larger parade for 2019. Your support contributes to the growth of our community. The Osage City Chamber of Commerce and Diane Michael, Parade Committee Chairman would like to take this opportunity to thank those that participated in the 2018 Osage City Fair Parade. Cutting the ribbon, front from left, Jan Ogleby, Jodi Smith, Jodi Lucke, Mike Lucke, Kelli Bowin, Brady Bowin, Breckin Bowin, Tara Azwell, Thelma Humerickhouse, Joe Humerickhouse, Jeanette Swarts; back, Ann Lusk, Dave Azwell, Jeff Pearson, Casey Mussatto. 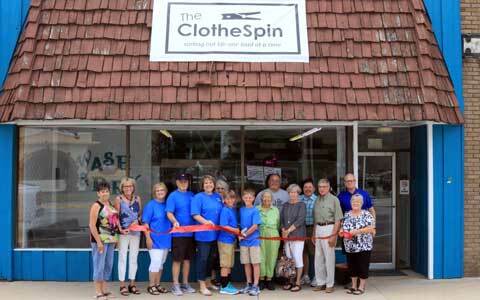 The Osage City Chamber of Commerce conducted a ribbon cutting Tuesday, June 19th at “The ClotheSpin”, the downtown laundromat. The facility, located at 505 Market, was purchased by resident Kelli Bowin in February and underwent a complete renovation. Kelli said she is very happy to be a partner in the downtown. “I’ve been looking for a way to invest in downtown Osage City and this was the perfect opportunity,” she said. “We spent a few weeks designing a new interior and remodeling the building and we’re very pleased with the support from Osage and the surrounding communities.” She also mentioned that this was a perfect opportunity to teach her boys, Breckin, 13 and Brady, 10, how to run and operate a business. “The ClotheSpin” features include two 40-pound washers, several front loading machines and eight front loading dryers. Hours of operation are 8am to 9pm, 7 days a week. Jerry and Marilyn Giesy represented the city as the 2018 Mr. and Mrs. Osage City. They felt very honored and appreciative for being selected. Jerry and Marilyn have been residents of Osage City since 1968. They moved from Kansas City when they purchased the Larson Food Market which was located in the downtown business district. Along with taking care of three children, Marilyn also worked at the store taking care of the payroll until computers took over. In 2001, they built and opened a new 21,000 square feet store which is located where the Chief Motel once was. The grocery business has become a family affair when Steve and Brian joined the business in the 80’s. Their son-in-law Jim works at the store along with grandsons Jules and John. Jerry and Marilyn have three children, Steve (Michelle); Brian (Marilyn) and Renee (deceased), (Jim). They have eight grandchildren and two great-grandchildren. They are very active and supportive in the community. They have been members of the Osage City Country Club, Osage City Chamber of Commerce and the Methodist Church. Jerry is a member of the Lions Club and Marilyn is a member of the UMC, belongs to many social clubs and enjoys playing card games, Mexican dominoes and traveling.